Exquisite plain sewing is an art form all its own! Are you a beginning sewer hoping to learn how to "do it right"? Are you an experienced seamstress looking to improve your techniques in fine hand-sewing? Are you a re-enactor seeking the skills to replicate 18th century garments in their smallest details? Sharon has spent thirty years learning the fine points of 18th century hand-sewing and perfecting her technique by studying original garments and by experimenting how to replicate them. 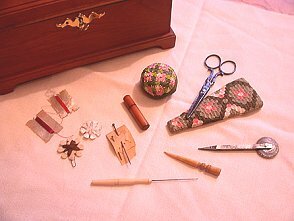 Now she'll share with you what she's learned---the tools, tips and techniques which will enable you to reproduce 18th century 'plain sewing', or fine hand-sewing, in the smallest details. In this class you'll learn how to choose and use the right needles, thread, and other necessities. You'll learn the basic stitches: running-stitch, back-stitch, whip-stitch, hemming and gathering, in the correct period manner. No previous experience is necessary, but whatever your skill level, you'll learn some new strategies. All materials will be provided. You'll leave with a completed (or nearly!) 18th century linen apron, and the confidence to apply your new skills to more complex projects. Come prepared with your choice of cap pattern already cut out in fine linen (3.5 oz or less) or 100% cotton organdy. 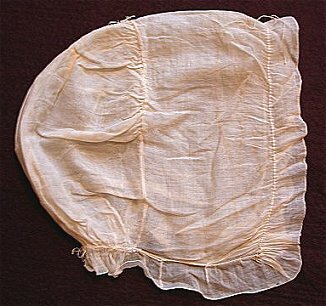 Examine an antique original cap and learn to construct your own using period correct stitches and construction methods. The class assumes basic sewing skills on the part of participants, and we’ll work on refining your techniques. We’ll review the “best tools for the job”, but bring your own needles, pins, thimble, thread and scissors. Examine an actual, original, provenanced mid 18c shift from a private collection. During the workshop, you will construct one shift sleeve, using the documented techniques as you will see them on the original. With a graphed measured drawing and directions for construction methods, you will then be able to complete your shift on your own as an exact reproduction of the original. A materials list will be sent to you. Review the history and role of canvas-work in 18c clothing and furnishings, then learn the basics of 18c canvas work by working a “flamestitch” wallet in wool on linen canvas. All the materials for the canvas-work will be provided. You will also receive directions and patterns for finishing your wallet with your own lining fabric and binding tape. Make a gown by draping! Working in pairs, you will have a gown draped on your “stayed” body and learn to drape on someone else. Documented 18c techniques of gown construction will be stressed, and correct sewing stitches and methods reviewed. Some preparatory sewing will be necessary before the class. You will be sent instructions and a list of materials needed. 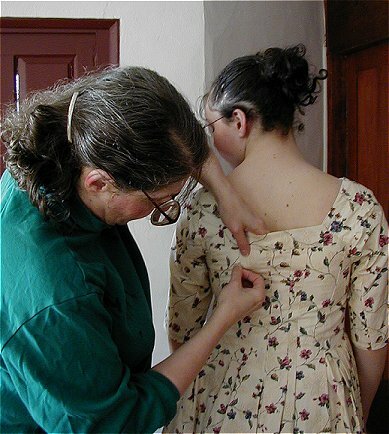 All workshops are taught by Sharon Ann Burnston, respected authority on the cut and construction of 18c American clothing, and author of Fitting & Proper, 18th Century Clothing from the Collection of the Chester County Historical Society. The workshops will take place in the period ambiance of Sharon’s restored 18th century home. 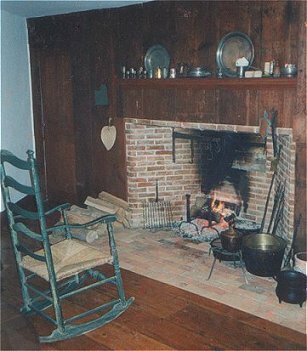 If it’s cold enough, we’ll cozy up to a fire on the cooking hearth. Class size will be small, as indicated for each class, for a truly one-on-one learning experience. Each workshop will run from 10 am to 6 pm, with a one hour break for a lunch on your own. Light refreshments (cheese, crackers, tea) will be provided, but meals and lodging are not included. Convenient low-cost lodging is available nearby. Stay over an extra night and spend Sunday combing the 20-plus antique shops on "Antique Alley" just minutes down the road!